Q. This is something that has been weighing very heavily on my heart for the past couple of years. I have always gone to church on Sundays (among several other nights of the week as well), but the main worship service is held on Sunday Mornings. But in the last few years, I have wondered if maybe we're all in error regarding this—as it was the Catholic church who changed the Sabbath day from Saturday to Sunday—not God. I haven't been able to find one scripture where God instructed us to move or change the Sabbath Day...so aren't we all breaking commandment number 4 by attending our church services on Sundays? I mean it seems to reason that if we are still NOT to murder, steal, commit adultery, lie etc., why wouldn't we also still be required to observe the Sabbath Day as God commanded? (and NO I am not a Seventh Day Adventist—but I have been wondering if that is the one thing that they did get right). I see that in Exodus 20:8 (10 Commandments) that God does say that we are to "Remember the Sabbath and keep it Holy"; and I see that in the New Testament, that in John 14:15 Jesus does say "If you Love Me, you will keep My Commandments." So like I said, it just seems like we all know that we aren't supposed to murder, steal, commit adultery, lie etc., but for some reason we (all of us who attend church on Sundays) have decided that we don't have to obey that one commandment. I know that we are not to treat God's word like a Burger King menu and pick and choose which Scriptures we feel like following—so how is this any different? This has been a constant worry of mine for the last couple of years after hearing a pretty popular TV Bible Teacher say that those of us who do not observe the Sabbath would suffer the consequences of our disobedience regarding this, so I would really appreciate it if you could shed some light on this so that I can have a better understanding and peace about it in my heart once and for all. A. 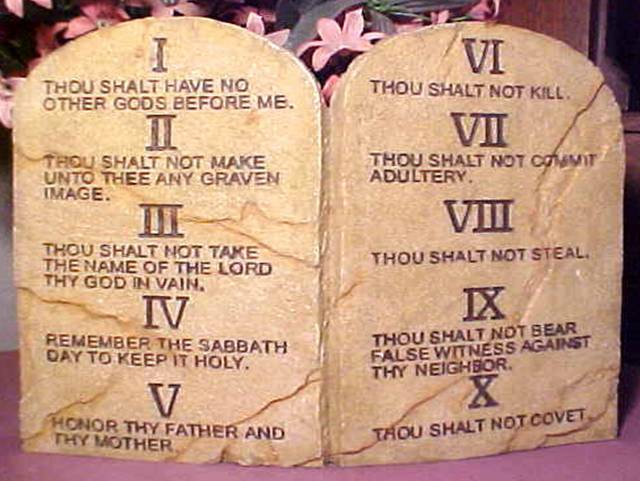 This is a great question which underscores a basic confusion which plagues many Christians in relation to the Ten Commandments: if the Ten Commandments were emphasized by God—being the only commandments written on stone by His very finger (Ex. 32:16; Deu. 9:10)—and are so highly revered and fought over in our law courts, why is it that many Christians seem to disregard the 4th commandment? This is a large topic with many subtleties which I cannot address in the space available to me here. But after we survey some of the related issues, I hope we can come to a point of clarity based on some clear principles found in Scripture. "Christian Sabbath" Keepers—These Christians generally consider Sunday as the so-called "Christian Sabbath." Generally, they see the original Sabbath as having moved from Saturday to Sunday (often inferred from the practices of the early Church, Acts 20:7; 1 Cor. 16:2), or having been superseded by an equivalent New Testament practice. By attending Church and avoiding work on Sunday, they see themselves as "keeping the Sabbath" and honoring the fourth commandment. They believe that other Christians who do not set aside this day to the Lord are in violation of the fourth commandment or are displeasing to God. Sabbath Keepers—These Christians hold views similar to the first group, but regard the Sabbath as still being on Saturday (from sundown Friday to sundown Saturday). They interpret their practices on that day of the week as "keeping the Sabbath" and as something which is incumbent upon all believers. Christ as Sabbath—These Christians view the Sabbath command as no longer being incumbent upon Christians and understand Christ as their rest (Heb. 4:1-11). They believe that Christians are free to observe any day or all days as special unto the Lord (Rom. 14:5; Gal. 4:9-11; Col. 2:16-17). I am among this group. The Sabbath was never moved from Saturday to Sunday. Nowhere in the New Testament do we see indication that the Sabbath changed days. Regulations for keeping the Sabbath involved more than simply assembling to worship God or avoiding work or commerce. Included were additional restrictions such as avoiding carrying heavy loads (Jer. 17:21-27) or building a fire (Ex. 35:3). (In fact, during the pogroms of Jewish persecution, the lack of smoke from a chimney on Saturday was used as a tell-tale sign to Jewish persecutors of Jews in their midst. And, interestingly enough, our electric cook stove has a Sabbath feature which provides for the ability to cook without "lighting a fire on the Sabbath.") Thus, the Christian interpretation of fulfilling the Sabbath is typically nothing like what Israel followed in the Old Testament. The Sabbath, among the other nine commandments, was uniquely a sign setting Israel apart from all other nations (Ex. 31:13,17). Keeping the law is an all or nothing proposition when it is appealed to as a basis of being seen as righteous before God. "For whoever shall keep the whole law, and yet stumble in one point, he is guilty of all" (Jas. 2:10 cf. Gal. 3:10; 5:3). The law is extensive and overwhelming. In the same way which Christian "Sabbath Keepers" often gloss over the more subtle aspects of what it really meant to keep the Sabbath in the Old Testament, they also fail to see the entire body of the law given to Moses as a comprehensive unit (whether or not they divide it into civil, ceremonial, and memorial aspects). Yes, the first ten are highlighted, but just keep reading! The rabbis have identified another 603 positive and negative commands which are all part and parcel of the Mosaic law. Along with the Sabbath, another sign given to Israel in relation to the Abrahamic covenant—and reiterated in the passover regulations and giving of the law at Sinai—is circumcision (Ex. 12:44-48; Lev. 12:3). How many Sabbath Keeping Christians, even though they may view their practice as non-compulsory and mainly God-honoring, also practice circumcision for the same purposes? I would hazard to guess very few (Gal. 5:2-6; 6:13). A problem with the notion of Sabbath keeping is, although it may begin as merely a personal choice to honor God, it often crosses a line where it becomes accompanied by the idea that the practitioner is more obedient and therefore more pleasing to God. This, then, inexorably leads in the direction of legalism which Paul is most concerned to guard against because it empowers the flesh toward sin (Rom. 7:8-13). It is from progressive revelation that I find that we are not under the Law of Moses (Rom. 6:14; 7:4-6; 10:4; 2 Cor. 3:11; Gal. 3:25; Gal. 5:18; Col. 2:14; Heb. 7:18; 8:13), but the Law of Christ (Rom. 8:2; 13:8-10; 1Cor. 9:21; Gal. 6:2; Jas. 1:25; 2:12). 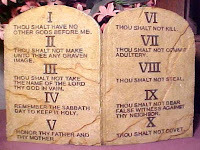 A study of Christ's teachings (as well as other NT writers) will reveal that the moral teachings of the Ten Commandments, part of the Law of Moses, are embodied within the Law of Christ. Interestingly, the fourth commandment concerning Sabbath observance is nowhere found in the New Testament. When we examine the requirements which the Jerusalem elders imposed upon Gentile believers over the issue of whether Gentile believers should be circumcised (another requirement of the law), notice that neither circumcision nor Sabbath-keeping are mentioned (Acts 15:22-29; 21:25). If there were ever a time and place to clarify that Sabbath keeping was the expected norm for believers—especially Gentile believers—this would have been the place to do so. Yet no mention is made of the Sabbath. This is highly significant! In fact, we find just the opposite, that we are free to observe or not observe various days (Colossians 2:16-17). Individual Christians are to model their behavior after the moral precepts of God—which are certainly expressed in the moral portions of the law, especially as highlighted in the Ten Commandments. But they are free in regard to "keeping the law" as a means of righteousness. One believer may choose to set aside a day "unto the Lord" and another may not. Either way, it is important that neither impose their preference on the other and that both realize that the law is not the primary motivator or focus for the believer now that Christ has come and fulfilled it in Himself (Gal. 5:4). We have already fulfilled the righteous requirements of the law through our identification with Christ and now we have entered His rest—Christ is now our Sabbath (Heb. 4:1-11). Although Paul is here speaking about adding circumcision to faith, we need to guard against other additions to faith as well. So long as setting aside a day unto the Lord is not motivated by self-righteousness or legalism or imposed on others, we are free to do so. For not even those who are circumcised keep the law, but they desire to have you circumcised that they may boast in your flesh (Gal 6:13).